« What did Martin Luther King, Jr. write about religion? Front-runner Hillary Clinton often sounded like an underdog, as she attacked the Vermont senator for flip-flopping on guns, proposing an unrealistic health care plan and admitting that he would raise taxes on the middle class. The former Secretary of State closely linked herself with Barack Obama, praising the president repeatedly as she appealed to African American voters who could save her campaign if she loses Iowa and New Hampshire. She had a very strong closing argument and dominated when talk turned to foreign policy. CHARLESTON, SC — Whether it was because of his neck-and-neck poll numbers in Iowa, or because of the Clinton campaign attacks on him, or because he released policy proposals in a 24-hour span to protect himself (on guns and health care), last night’s debate here was largely about Bernie Sanders. Clinton did not respond well to Connor Franta’s (with 5 million YouTube subscribers) and NBC moderator Lester Holt’s question about why she’s running behind Sanders by a 2-1 margin with younger voters. Clinton earns a C- on millennials in general and an F for failing to demand speaking time on climate change. Sanders hammered his argument that he is not beholden to big corporate interests: he emphasized his lack of a super PAC and his reliance on working class donors for his campaign. Not once, but twice he reminded us that Goldman Sachs was fined $5 billion dollars for its role in the financial crisis, yet nobody went to jail — even as young people with a little weed spend more time incarcerated in the United States. Sanders ran into some trouble here. Let’s be honest: Sander’s plans — free college, for example — will cost a ton, and he needs to be more specific on how to pay for them. Taxing Wall Street speculation wasn’t specific enough, and he didn’t provide the answer of how much money that will bring in. So he was already in trouble in the debate, and that’s before he got pounded by Andrea Mitchell for raising taxes on the middle class. Twice. Grade: D.
As far as who “won” politically, the upcoming Iowa caucus, followed by various primaries, will show who certain voters prefer. Like Hillary Clinton, Bernie Sanders is pro-abortion and and proponent of the LGBT agenda. 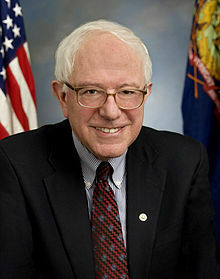 Bernie Sanders is a bigger proponent of legalizing marijuana in the USA than Hillary Clinton (see Bernie Sanders proposes a ‘marijuana nation’) and seems to be more willing to spread tax increases that Hillary Clinton (Hillary Clinton basically claims she wants to tax higher income people even higher than they now are being taxed). When the Democratic candidates were each asked what their top three priorities were for the USA, not one of them mentioned national defense or terrorism. Nor did any of them hint that they wanted to call for national repentance. But without national repentance, we will see more terrorism (see Why Terrorism? Is Terrorism Prophesied?) as well as more “climate change” (see Weather Blessings and Sorrows) problems. Ultimately, we will see that, because of debt and other issues, the USA will one day be taken over and conquered militarily according to biblical prophecy (Habakkuk 2:6-8; Daniel 11:39). We are getting closer to the Great Tribulation that Jesus mentioned which is also described in the Book of the Apocalypse (watch the video 2016: The State of the Apocalypse). Neither the Republican nor Democratic candidates for the USA presidency have professed a strategy that will stop that. This entry was posted on Monday, January 18th, 2016 at 8:00 am	and is filed under Prophecy.